I can’t remember if I’ve told this story before, but for my birthday in 1970, I got a sterling silver charm bracelet. My first charm, a silhouette of a girl’s head, had my name and the date of my 6th birthday engraved on it. I loved my charm bracelet and I wore it to first grade that fall at the Marion T. Morse Elementary School. During recess one fall day, between swinging and playing on the merry-go-round, I lost the charm. I’m sure I cried. I was only six, but even at that tender age, I had a sentimental streak, saving embossed napkins from restaurants, bookmarks from the library, and birthday cards. That we might find the little silver charm, no bigger than a nickel, seemed impossible given the sand and gravel under the swing set. I don’t remember who found it, but someone did. Everyone was relieved, especially me because I hated losing things and it’s quite possible that I had a little “I lost something” anxiety attack right there on the playground. After the incident, I never lost a charm or my charm bracelet again. I still have it and a few links were added over the years; I wear it sometimes. I only acquired 12 additional charms, but they jingle and I like the sentimental feeling I have when I wear it. That swing set is still at the Marion T. Morse School, or the “MTM Center.” I stopped there on my walk around town last night and thought about the charm bracelet incident. I sat on the swing, enjoying the childish activity in the receding daylight. It’s funny how some childhood memories can be so vivid. The other day, someone asked me what it’s like to be living here in the place I grew up after being away for 30 years. I said it was good; there had been a period of adjustment, but that this was where I wanted to be. I would have been lying if I had said it was always perfect. It’s more like living in a kaleidoscope of memories tumbling around with diamond-cut shapes of the present reality. This year, I’m hosting The Moxie Recipe Contest there. We’ll taste some delicious dishes whipped up with a bit of Moxie and we’ll drink the distinctively different elixir. Find me (and maybe yourself) there on July 11! Well of course I’ll be wearing my charm bracelet! The Moxie Recipe Contest will be held on Saturday afternoon, July 11, 2015, at the MTM Center Gymnasium, 18 School Street, Lisbon Falls, Maine. The judging begins at 2:00 p.m. 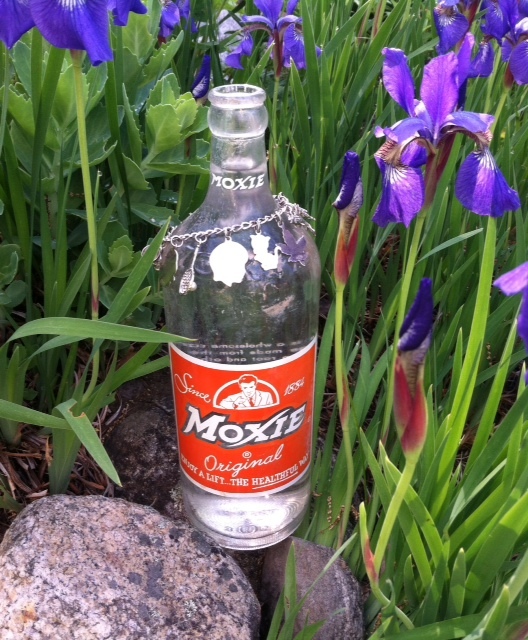 This entry was posted in Friday Pillow Talk, Moxie Recipe Contest and tagged 2015 Moxie Recipe Contest, Handy found the bottle in the basement, I was lost. Bookmark the permalink.